The Department selected AI.DATALIFT to move over 52tb of data from Google Docs (AO Docs) and Files Shares to the cloud. Due to the nature of the body, it was vital it had a simple cloud-based platform to review, archive or delete information. It was estimated that, without the change, it would take the Department’s Record Managers 140 years to review all content manually. 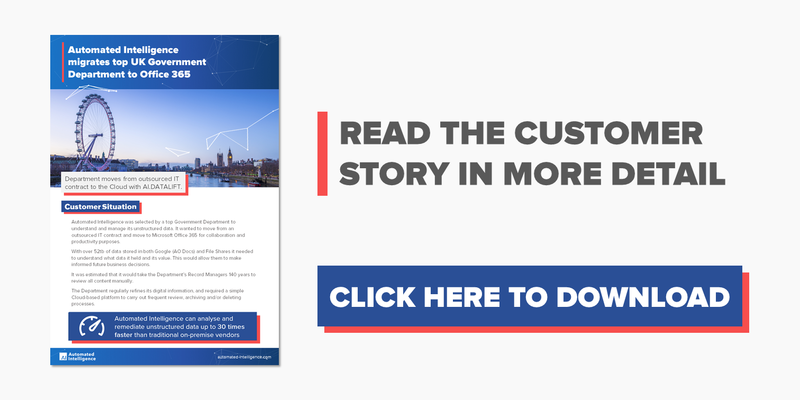 To find out how AI.DATALIFT’s machine learning capabilities allowed this Government body to extract intelligent insights from its data, download the full case study below.